School's out for the Easter holidays and I've been madly writing lists, cooking and baking for our upcoming camping trip. The weather turned cold and rainy this week and the forecast for camping isn't looking fabulous either. The BEST Paleo Hot Cross Buns you have EVER eaten ...buns ....not muffins. There's a nut free version too. Inside Out Peanut Butter Cups. I snatched this recipe from Clean Eating with a Dirty Mind. Nut Free Raw Caramel Slice ....Paleo and Full GAPS friendly. 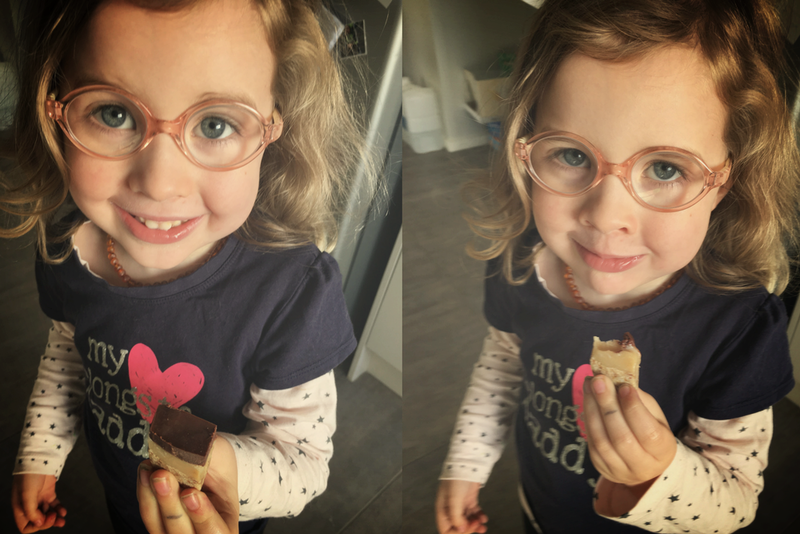 You'll notice I'll be popping a few nut free recipes up here as my Littlest gets belly aches with nuts ....and pretty much every school in Canberra is a nut free school. Grease a medium size dish and line with baking paper. Add base ingredients to food processor or thermomix and process until fine and starting to bind together. If it's not coming together, add a TINY drizzle of water to help the process along. Press this mix into the base of the dish and set aside. Add all caramel ingredients into a clean blender or thermomix, and blend until the mixture is smooth and combined. Don't stress if there is a white liquid separating from the mix ....it will be fine. Pour this mix over the top of the base and spread evenly. Place in the freezer for 30 minutes. Once the caramel is set, begin prepping the chocolate layer. Melt the coconut oil at a low temperature (you don't want the chocolate too hot as it will melt and blend with the caramel layer). Add the remaining chocolate ingredients and blend until smooth. Cool the chocolate if needed before pouring it over the top of the caramel layer. Spread evenly and place in the freezer for 1 hour or until the slice is completely set. Remove the slice from the dish and cut into approximately 20 - 24 small pieces. Store the slice in the freezer so you don't scoff it all in one hit. If it's frozen ...it's way more difficult to eat :).